The surname Adams has been local to the Winslow area and North Bucks since the Middle Ages, and in 1588 Theophilis Adams was granted land to rent in Swanbourne by Sir John Fortescue (the cousin of Queen Elizabeth 1 and Overlord of the Manor), including lands which before the reformation were thought to be owned by a nunnery (Clear, 1895). 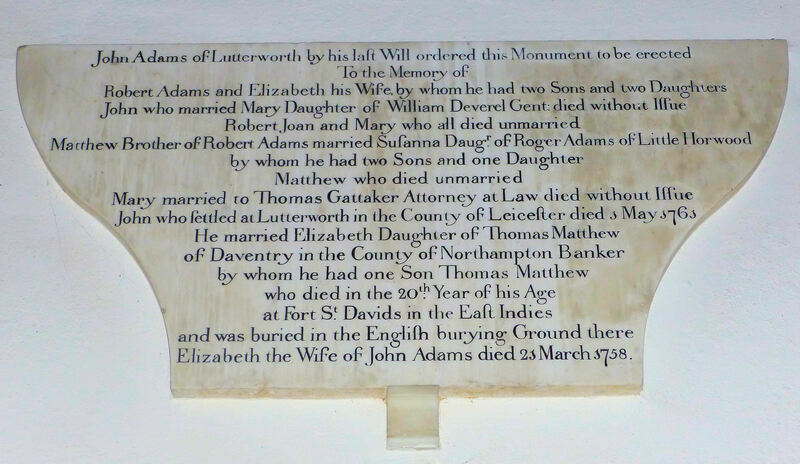 Robert Adams (probably a descendant of Theophilis) married Alice Deverill in 1583 in Swanbourne (Reading, 1994). The couple took over premises which included a considerable acreage of farmland and buildings named as Mearton Farm, subsequently re-named, to “Adams Farm” at Mearton End (now Nearton End). Since 1898 this has been known as Athawes Farm. They became owners of the farm and the farmland that they had been renting from Sir John by gift and favour. Here they brought up three children to adulthood – Agnes, John and Thomas. At this time, to be the Overlord of the Manor meant that you had the Great Tithes attached. These tithes committed the Overlord to appoint and pay the clergy as well as paying for maintenance of Church property. Sir John Fortescue was a close adviser to Queen Elizabeth 1 and England’s Chancellor of the Exchequer. He was Overlord of several manors, including Salden near Mursley, and Winslow. At Salden, he had an enormous mansion constructed. 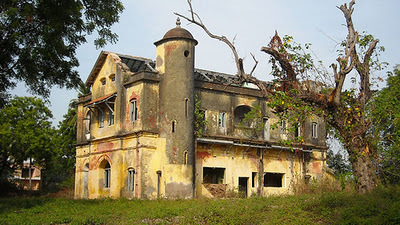 All that is left of this mansion today are two farmhouses which are simply derived from remaining fragments of the building which was mostly pulled down in Georgian times (Clear 1895, Reading 1993). 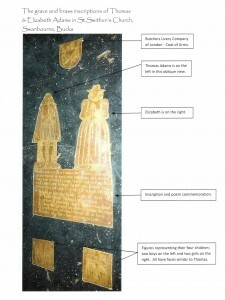 In 1624 John and Thomas purchased the Lordship title, becoming Joint Overlords of the Manor as part of the purchase of two mansions, the White House (now known as the Old House) occupied by John, and the Manor House occupied by Thomas and his wife Elizabeth and subsequently their four children. 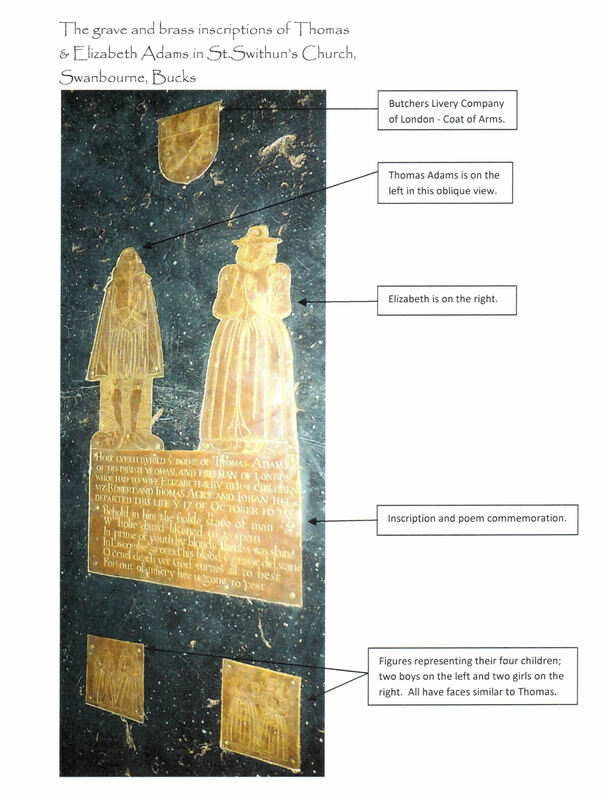 Thomas was a prominent member of the London Butchers Livery Company, basically a trade association intended for those connected with butchery business. Hence, he had business interests in London, and far from remaining at his Manor, would often take business trips to the capital. It is quite likely that he supplied meat to the London market from his farms. On Saturday 17th October, 1626, Thomas was on his way to London. His route would take him through Stewkley, Soulbury and Leighton Buzzard to get to the A5 which was the route that he took. As this was at the weekend, the reason for his journey could equally have been pleasure or business. 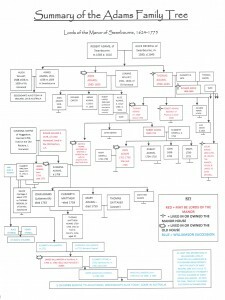 Amazing fact- Thomas Adams wrote his Will only TWO DAYS before his murder. It was written on Thursday, 15th October, 1626. He was murdered on Saturday, 17th of October, 1626. 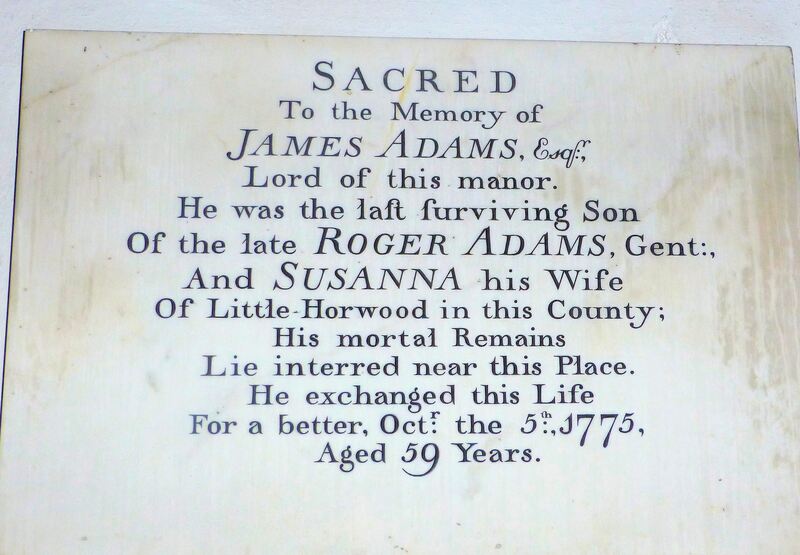 Adams – Ghost stories, murder & family tree. 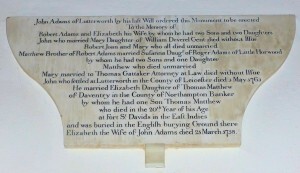 Memorial in St. Swithun’s Church to the Adams family which tells how the Adams Family died out. Fort St David in South East India is now a shell. 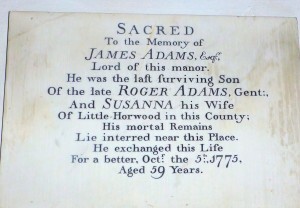 It was where the last direct line descendant of John Adams died in the 18th Century.